White House Refuses To Condemn Russia After British Prime Minister Says They Poisoned Former Spy [VIDEO] - Joe.My.God. Former spy Sergei Skripal and his daughter were poisoned by a military-grade nerve agent of a type developed by Russia, Theresa May has told MPs. The PM said the government concluded it was “highly likely” Russia was responsible for the Salisbury attack. The Foreign Office summoned Russia’s ambassador to provide an explanation. Mrs May said if there is no “credible response” by the end of Tuesday, the UK would conclude there has been an “unlawful use of force” by Moscow. 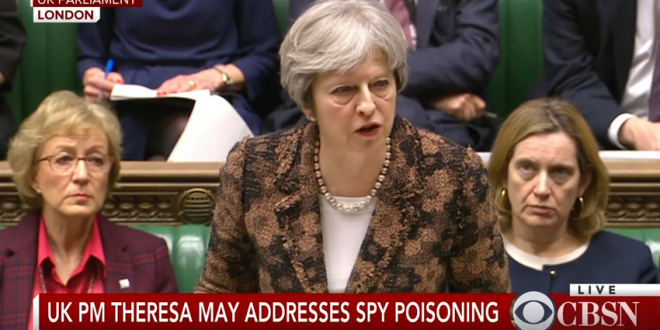 The chemical used in the attack, the PM said, has been identified as being part of a group of nerve agents known as Novichok.